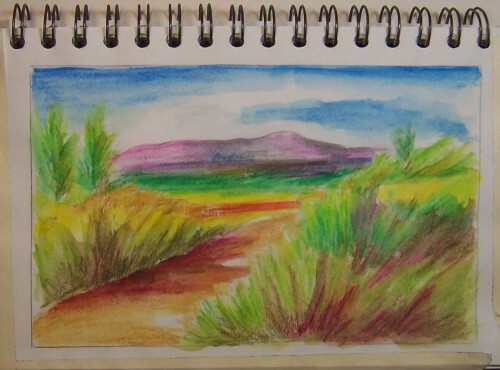 Well, this is also a doodle using watercolor pencils, but this time no ink. 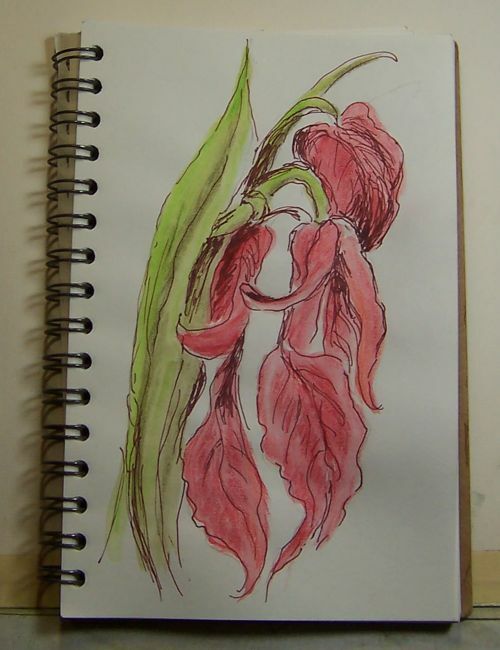 I had been given a set of Derwent Inktense watersoluble ink pencils, but had never used them. It’s been awhile since I used watercolor pencils, so I’m not sure so much what the difference is. So, I guess I’ll have to get out the regular ones and see what that might be. The advertising I’ve seen for them praises their intense bright colors. I’m not that sure just doing these last two. Maybe I’ll have time tomorrow to try something with my regular set and see if they are right. I have to say that the colors that show in the lead don’t translate well after water is added. We’ll see. (I used my 5-1/2 X 8-1/2 sketch pad……which is not watercolor paper, so I thought I’d have the photo include the taped edges I use to try and control buckling when the water is applied.